I’m a lifelong fan of the outdoors and I love blurring the lines between inside and outside when designing a space. I like to bring natural materials such as raw woods, plants and natural textures inside and I like to treat outdoor spaces in the same way I’d treat an indoor room. So when Cuprinol asked me if I’d like to decorate and furnish a shed in conjunction with ‘Shed of the Year’ on Channel 4 I jumped at the chance! We didn’t really need a shed however, but for a long time we had wanted to build after a veranda type space at the bottom of the garden. We knew that this would be a fun summer project that wouldn’t take long as we have lots of friends and family who would help us out. Cuprinol loved the idea of a veranda as it shows that it’s not just sheds that can be made over into fun outdoor spaces. 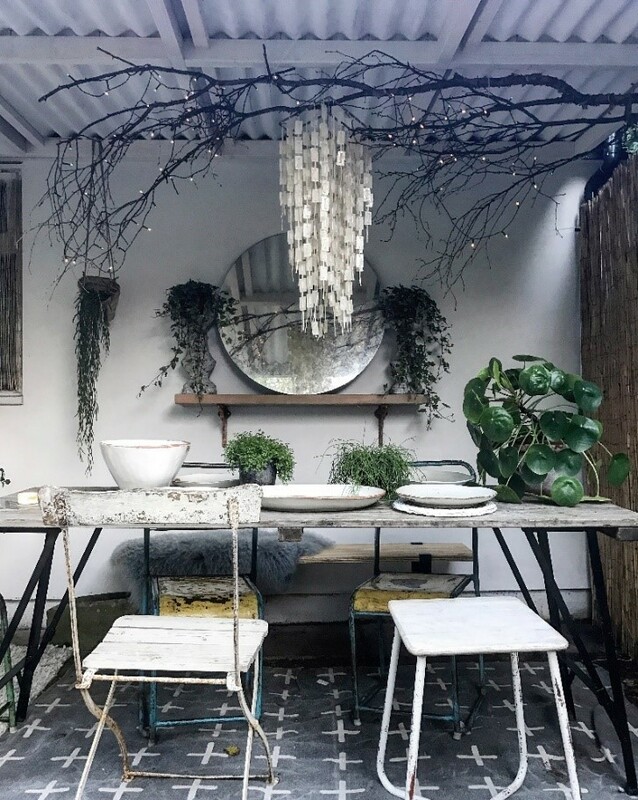 Any covered space outdoors can be made into an outdoor room with a lick of paint and a bit of imagination. So, instead of a shed, we bought the materials needed for the veranda from B & Q. My initial inspiration for the veranda was the ‘Woodland Stargazer’, a finalist in the Eco Category on Cuprinol’s ‘Shed of the Year’. Owned by Annie Maclean in Fort William, the Woodland Stargazer is an off-grid tower hidden in woodland near the owner’s cottage. The roof is glazed to allow for stargazing and the whole building is built from recycled or sustainable materials. I was very inspired by the fact that it’s an all year round space that you can escape to be close to nature. It doesn’t have to be summer. It’s furnished cosily and comfortably and has a built in log burner to keep you warm all year round. And I love that you can see the stars through the glazed roof. I like its simplicity, how it blends in with the scenery, and how it’s furnished like a normal room. We then sourced more wooden posts from B & Q to create the frame to support the roof: Constructional Timber | Timber & Sheet Materials. A supporting length of wood was then fixed to the fascia board on the garage to support the frame. We then painted the wall of the garage in two coats of White Masonry paint- Weathershield’s Pure Brilliant White Masonry Paint provides great coverage! The floor is yet to be done so we laid down plastic and used some of our rugs to create a defined floor area. I then used furniture we already owned or sourced vintage and reclaimed furniture to dress the space. We decided to split the space into three – a living area, a dining area and a ‘cooking’ i.e. firepit area. The space was quick and easy to create and cost around £400. As the nights get colder we plan to install a woodburner / pizza oven and embrace the Danish ‘Hygge’ principle – wrapping up warm, drinking mulled wine and lighting the fire and candles - to keep the space useable. There’s no need to glaze the roof like ‘Woodland Stargazer’ because we can see the stars through the branches of the old apple tree next to the veranda. 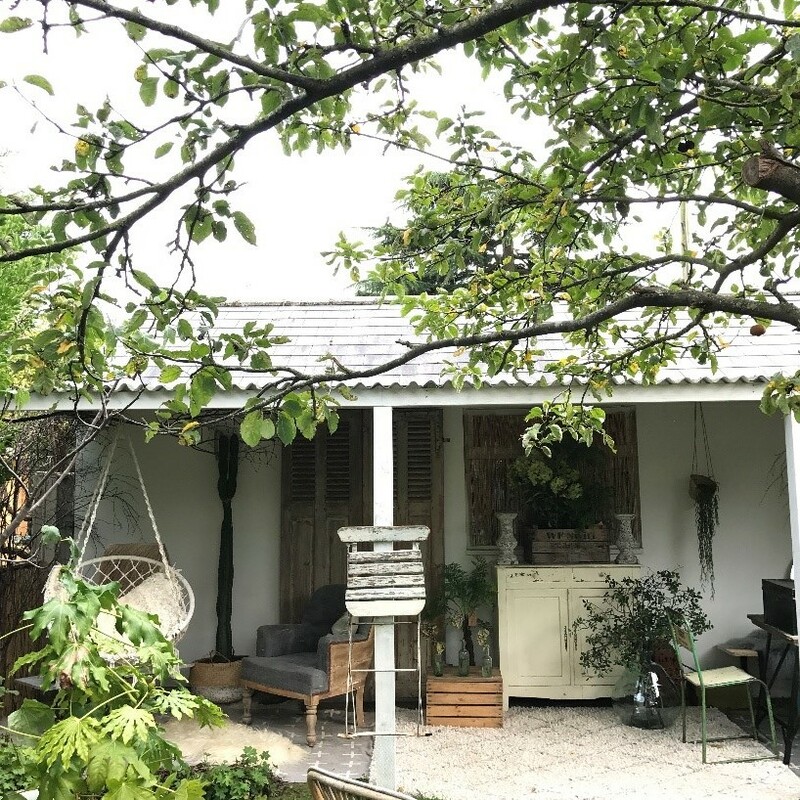 It’s a very versatile space and I can see it being used a lot in the future for book clubs, dinner parties and children’s parties, as well as peaceful evenings looking at the stars and listening to the owls in this quiet part of the garden. This post is a sponsored post from Cuprinol and Dulux UK.